You can select two BISAC categories, and they’re all relatively vague. BISAC codes are assigned to help publishers and libraries make sense of book subjects for the purposes of developing metadata. Amazon uses BISAC codes to some extent, but they also have their own internal ranking and categorization system that determines the all-important Top 100 lists. Bam! Easy as pie. All you need to do is make sure that your keywords match a category on that extended meta-list, and you’re good to go. I only had to give away seven copies of my preview in order to make it onto this list, and anyone looking for a coming of age story will see it right there in front of them. I hope this little walk-through helps you in your quest to find the right audience. I urge you to use some of your keywords for this very simple way to get your book in front of the right readers. After all, that’s what keywords are for! I don’t know why Amazon doesn’t explain this better during the process, but it’s fine with me that it’s still relatively under the radar. Yay for search optimization! I’m going to try this and see if it helps me at all with my science fiction/dystopian novella. 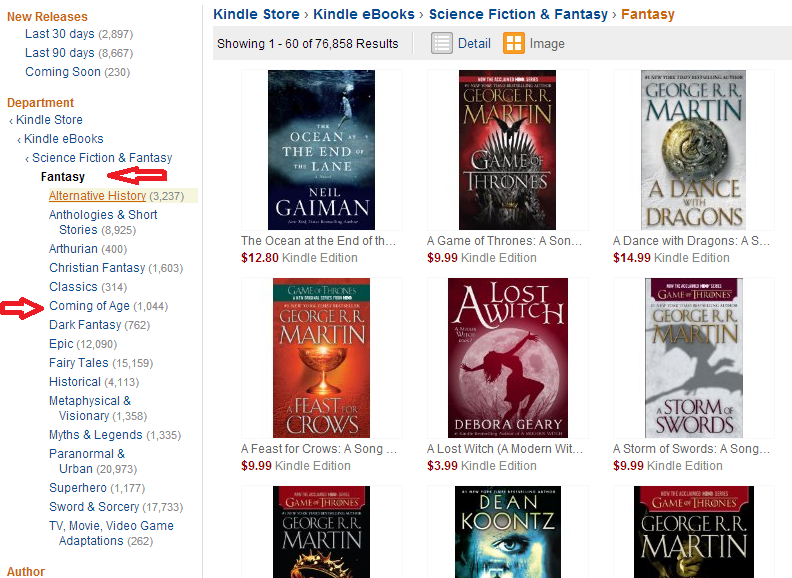 I put it under science fiction>dystopian and science fiction>apocalyptic and post-apocalyptic. I gave it the tags genetic engineering, coming of age, and so on. Hopefully it helps. Thanks, Jen! I pulled my hair out, wondering how to categorize my novels more specifically than “Fantasy — General” and “Fantasy — Epic,” which seemed to be my only choices. I will definitely reexamine my keywords. Bless you! This is brilliant! Always wondered where those categories came from. Thank you for sharing this. Fabulous information – have just spent most of the day trying to figure it out until I read this! Thanks Jen! If I understand right, as your 7 keywords, it is best to choose ” category words ” that you would choose from an extended meta-list ( as in your example with the categories on the left of George RR Martin’s books ) and not the BISAC categories. That is for the “search keywords” box; however how do you best fill out the ” add categories ” box for maximum exposure? Do you also choose from this extended meta- list or from the normal BISAC list which is given in FDP select? I’m not sure I completely understand your question, but the “Add Categories” box is the BISAC Box. You can only choose from a limited number of check-boxes. Those are the BISAC categories. You choose one main genre heading (fantasy, literary fiction, non-fiction) and one sub-genre category (epic, historical, contemporary) for the best effect. The only free-text input is the “keywords” section, which is where you would use the extended meta-list. Does that help? You answered my question perfectly. Thank you so much! Great information! very helpful! thank-you so much! I have been experimenting with this and having varying degrees of success. This helps further clarify things and saves me some legwork. Thanks! Your post was just the resource I was looking for today! Thank you so much for explaining this so well. Then make sure your copy includes keywords too. You can plug the url of the Amazon category into Google keyword tool to find what keywords to use in the copy. Just paste in the category url and get keyword ideas on that topic for your product description. In the second to last paragraph you said, “I only had to give away seven copies of my preview in order to make it onto this list.” I followed the instructions from your article, but what/how do you give away seven copies of your preview? Great article, by the way! I’ve been researching this process for days with my novels. 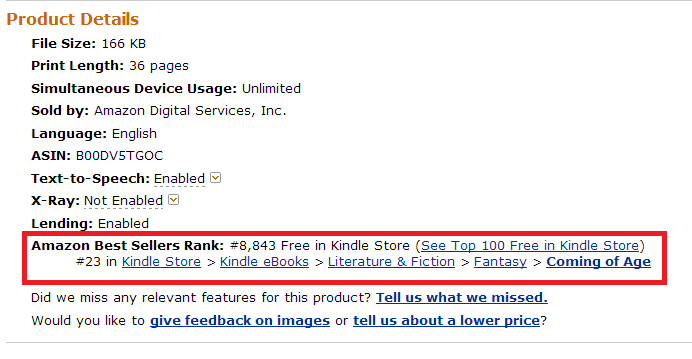 You need to enroll your Kindle book in Amazon’s KDP Select program in order to offer free promotions. Basically, in exchange for selling your ebook exclusively on Amazon, you get some perks like five days of setting your price to $0.00. You can’t make an ebook free on Amazon without being in this program (unless they decide to price match your book from another website, which you can’t really count on). Thank you! Great advice and informstion, generously shared. Thank you so much. Jackie Weger just apprised us eNovelAuthorsAtWork about your great post (and blog). It’s so interesting that Jackie Weger shared this with our group eNovelAuthorsAtWork today. I’m in the middle of changing and updating all of my KDP books and this information is very helpful and timely. Thank you! 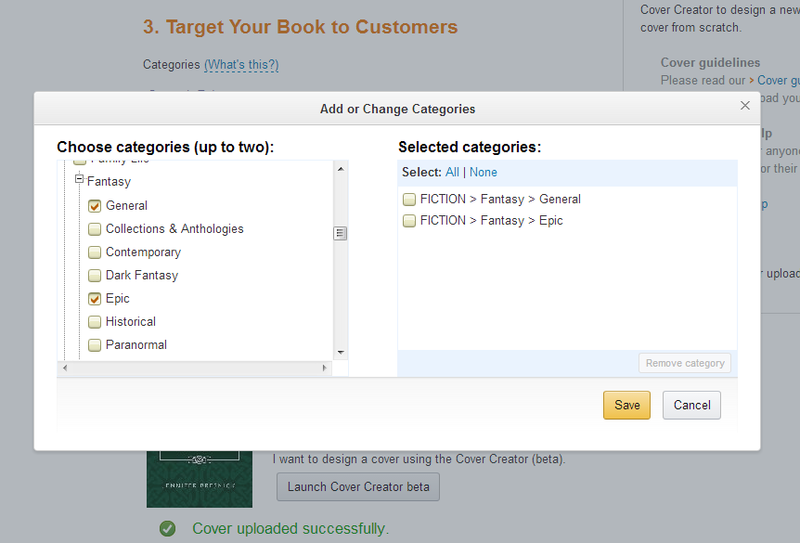 Here’s an extremely useful post to refer to when selecting Amazon categories. To make this technique even easier, I’ve compiled a searchable list of all 10,000 Amazon book categories with a title count for each category.